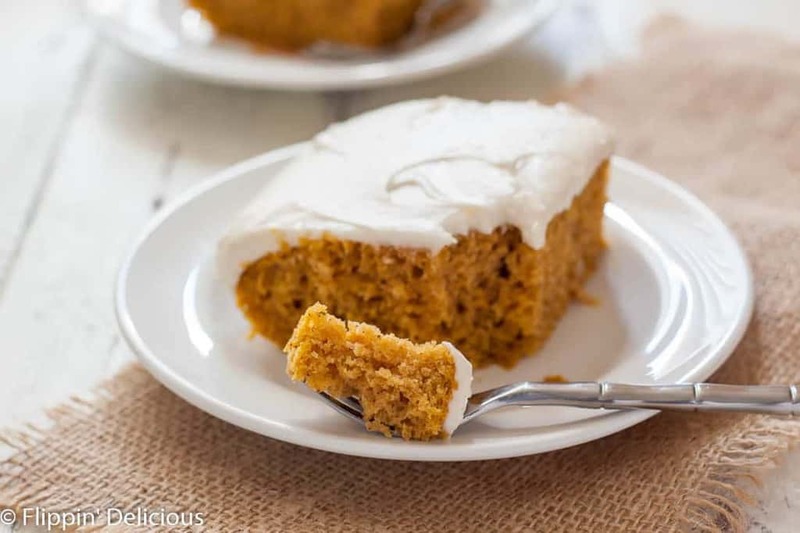 Moist Gluten Free Pumpkin Cake with cream cheese frosting is the ultimate easy fall dessert! Dairy free option. 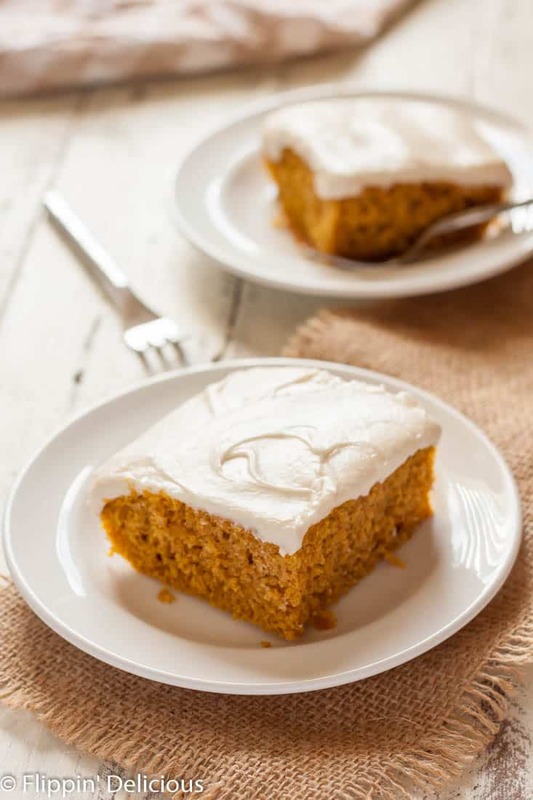 There is something about the combination of gluten free pumpkin cake with cream cheese frosting. Pumpkin and cream cheese just go hand in hand! 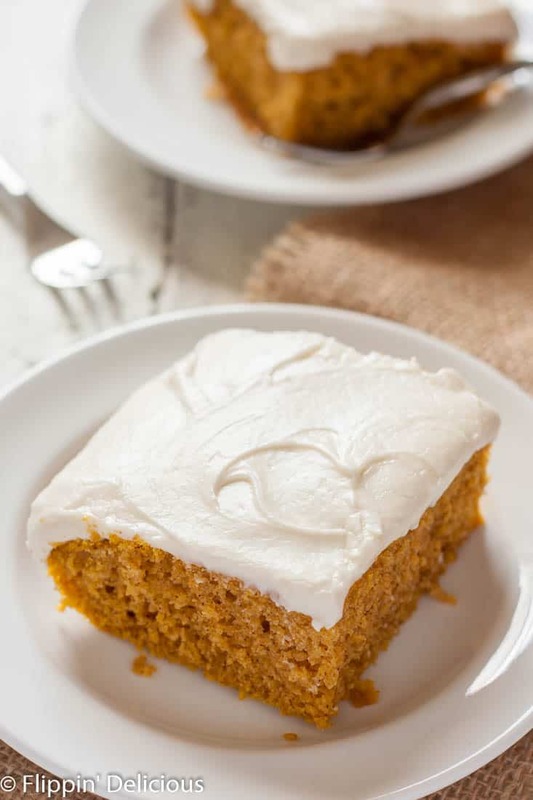 Since my family is dairy right now, I didn’t use my go-to easy cream cheese frosting, but instead whipped up a dairy free cream cheese frosting to spread over this gluten free pumpkin sheet cake. The cake itself is super easy to whip up. No stand mixer required! 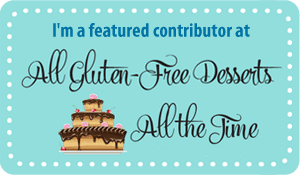 It is very similar to my gluten free pumpkin cupcakes and my gluten free pumpkin spice latte cupcakes, but in a super easy sheet cake baked in a 9×13 pan. I love baking sheet cakes in my glass pan that has a lid so that I can bake and store my finished frosted cake in the same dish. So easy! No fuss! 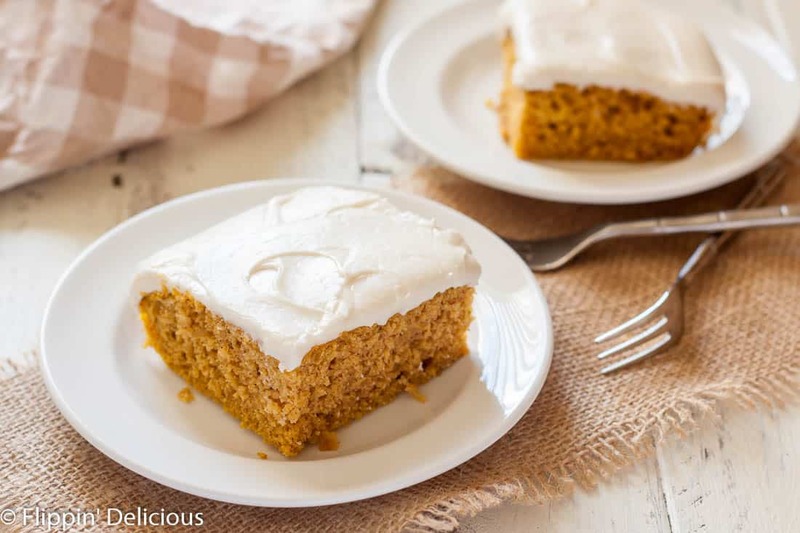 This recipe also makes a great pumpkin snack cake! I whisk together the dry ingredients, then make a “well” in the center and add the wet ingredients to the “well” so I can whisk just the wet ingredients together, and then stir the batter together. Then I only have to use 1 bowl too! Once the cake is cool I spread the frosting on top, no need for a piping bag or any decorations, though I am always up for sprinkles! You could also garnish your cake with a sprinkle of cinnamon sugar. As a busy work-at-home mom with 2 small kids I love recipes that make minimal dirty dishes, but don’t compromise on taste. 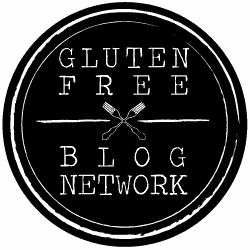 This gluten free pumpkin cake is that kind of recipe! 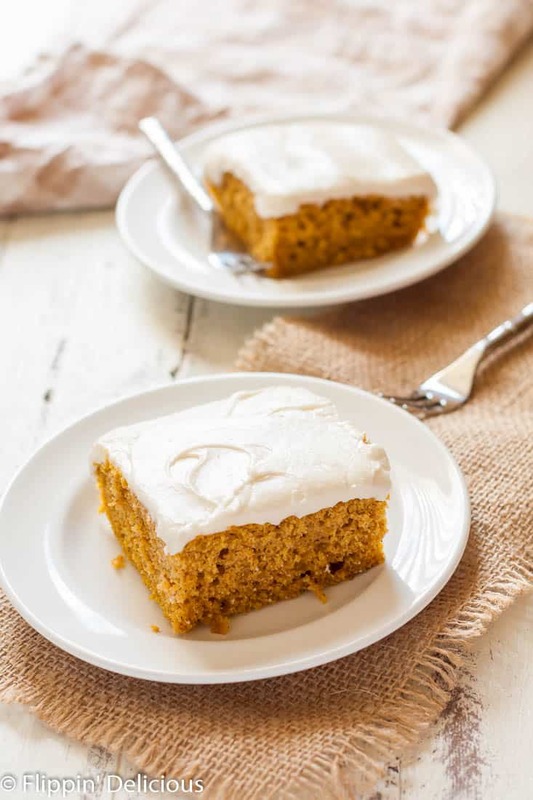 This is the perfect pumpkin cake recipe to bring to a gluten free potluck or to enjoy with family and friends to make any day a little bit more special. Preheat your oven to 350F. Lightly grease a 9x13 baking pan. In a mixing bowl whisk together the brown sugar, flour, baking powder and soda, salt, xanthan gum, and spices. Make a "well" in the dry ingredients and add the eggs, oil, milk, and pumpkin puree to the "well." Whisk the wet ingredients together, and then incorporate them into the dry ingredients until you have a smooth batter. Pour the batter into the prepared pan and bake for bake for 22-24 minutes or until a toothpick inserted near the center comes out mostly clean. Using electric beaters or a stand mixer whip the dairy free cream cheese and vegan butter until smooth and fluffy (2-3 minutes). Add the powdered sugar and vanilla, beat at low speed until incorporated and then at higher speed until light and fluffy, another 2-3 minutes.